B ill Bly is the author of the ongoing hypertext We Descend. Volume 1 of We Descend was published by Eastgate in 1997. Volume 2 was exhibited at the Convention of the Modern Language Association in January 2013 and 2014. His works also include Wyrmes Mete, a hypertext chapbook of poems, and, with John McDaid, he was awarded the John Culkin Award for Outstanding Praxis in the Field of Media Ecology for their music CD, Media Ecology Unplugged. As a teacher, a founding member of the Hypertext Writers Workshop, and the recorder for the legendary Cybermountain Colloquium, Bill Bly has also been active in working with colleagues and students in the creation of electronic literature. He taught dramatic literature and theatre history at New York University (NYU) for 20 years, until he became interested in hypertext, which he taught both at NYU and at Fordham University. He also ran the writing program at Wagner College in Staten Island. Currently, he teaches Speech Communication at Northampton Community College in Pennsylvania. In an Authoring Software statement about his densely layered work, We Descend, he sets forth the struggles and pleasures of creating hypertext. Beginning with reading Robert Coover's seminal article in New York Times Book Review,  he describes how he ordered every title published by Eastgate; his Eureka moment with Stuart Moulthrop's Victory Garden while participating in Robert Kendall's online Hypertext Poetry & Fiction class at the New School; the creation of We Descend in Storyspace; and the creation of We Descend Volume 2 in Tinderbox. "What started out in the early 1990s as a simple node-link hypertext has somehow turned into my life's work," Bly observes. W e Descend is an artifactual hypertext, presented as an archive of writings gathered and transmitted over a vast span of time. A Scholar discovers the previously unknown Testament of one Egderus, a humble scribe who lived many generations before. Egderus' work leads to even older materials, a fragmentary archive which somehow survived a cataclysm that all but wiped out the magnificent civilization of its ancient authors. These documents promise to make the Scholar's reputation, but instead they destroy him, in a brutal reversal that provokes disturbing speculations about the present as well as the past. We learn about the Scholar's world from his diary and the preparatory notes he makes for presenting the Egderus documenta to a convention of his peers. Egderus' era is delineated in his Testament, which also incorporates letters, notes left behind by predecessors, and other miscellanea that ended up in his possession. The fragmentary writings of the Ancients are mere scraps, almost impossible to interpret because their context is utterly vanished, but they provide a glimpse into a lost world that is both tantalizing and deeply troubling. The thoughtful reader will discern -- in the commentary and cross-references throughout the archive -- a more recent band of time during which they were collected and arranged, and begin to perceive, if only dimly, the otherwise unknown person(s) who performed this labor. An artifactual work like We Descend invites the reader to join a kind of research project: Although the writings may be carefully and logically organized, they are not processed into a tale that can be told by a single voice, but rather are presented undigested, and the reader must assemble a coherent story for the whole, on her own. In addition, using artifacts alone to tell the story foregrounds the three domains that any writing inhabits: text, meat, ghosts. The ghostly domain is, paradoxically, where the story comes to life, in mental pictures of imaginary persons saying imaginary words, doing imaginary deeds. It is also the "place" where author and reader meet, and the story can be transmitted from one mind to another. Actually, the earliest Writing in We Descend is dated 1984 -- four years before I touched a computer more sophisticated than an ATM -- and it begins "If this document is authentic, then a complete reappraisal will be necessary." By 1993, when I first encountered the word "hypertext" in an article by Robert Coover in the New York Times Book Review, I had maybe a thousand words' worth of notes, sketches, and snatches of dialogue for a project that had no name; they all seemed to belong together, but I didn't know how. Coover's article electrified me: I couldn't fathom what he was talking about, but I somehow knew it was important. So I wrote an inquiry to every person he said was working in this new medium of hypertext and asked them to tell me more. One such pioneer was Mark Bernstein of Eastgate Systems, who sent me a copy of Storyspace 1.0 on a small rigid diskette that worked in my Mac SE. The manual that came with the Storyspace demo was breezily confident and reassuring, and told me how to do this, and that, or, if I wanted to, some other thing. What I simply could not figure out was what I would be making -- or, for that matter, why I would want to perform any of those operations the manual so cheerfully taught me how to perform. Not liking to give up on something I just hadn't got the hang of yet, I thought maybe I would do better by reading some exemplary hypertexts. Along with Storyspace, I'd also ordered an issue of the Eastgate Quarterly Review of Hypertext, which comprised a paper Getting Started booklet and another floppy disk inserted into a totally badass black rubber jacket. I don't remember either work included on the disk, but at first encounter, I was even more befuddled after reading hypertext than I was trying to understand what Storyspace actually did. I continued all at sea for two years after that. I ordered every title in the Eastgate Catalogue. I read books and articles recommended by my correspondents. I attended a conference in Boston, and I continued to play with Storyspace, even though I wasn't having any fun. I did love Apple's Hypercard, and built stack after stack, but found that Hypercard didn't make writing very easy, and linking, though possible, was awkward. I could write in Storyspace, and link easily from one writing space to another, and I found out how to get under the hood in all those exemplary writings to examine their structure, but, like Vladimir in Waiting for Godot, I remained in the dark. The light dawned for me on a sunny afternoon in the summer of 1995, when I was taking Rob Kendall's Hypertext Poetry & Fiction class online at the New School. We'd been assigned to read Stuart Moulthrop's Victory Garden, which of course I'd already tried to read more than once before. I was tired. I was exasperated. I gave up. I got it. All of a sudden, the whole elaborate structure of Victory Garden emerged from the murk in my mind, and I could see it -- better, I could feel it. Thinking about it didn't help, looking at the maps didn't help, poking around under the hood didn't help. As best I can explain it, the only thing that worked was to look at enough of it enough times -- and then I could read it, almost the way you read someone's face or body language. Now I'd been writing seriously for decades: I was a prize-winning playwright, a published poet and fictioneer -- and I had no idea writing could do that. T he rest of my story's pretty much all tech. We Descend was originally written and built in Storyspace 1 on Macintosh computers running System 7 through MacOS 9. Vol. 1 was published by Eastgate in 1997 for Mac or Windows on floppy disk. The two versions differ significantly from each other in look-&-feel. An HTML excerpt for Rob Kendall's resource site WordCircuits was prepared in early 1998, using Adobe PageMill and Netscape Composer. By early 2006, most Macs were running OS X (which cannot open Storyspace 1 files) and post-iMac machines (i.e., after 2000) lacked a floppy drive, so I "translated" the Mac version into Storyspace 2, (which works in OS X) so that Eastgate could offer both Mac and Windows versions of We Descend bundled on CD. We Descend Vol. 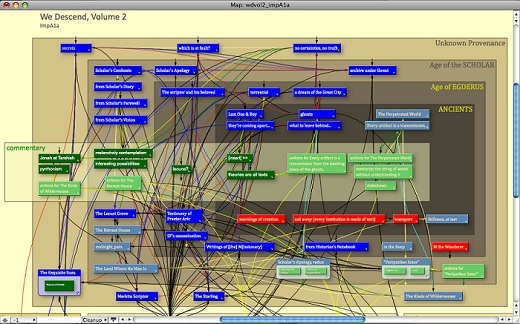 2 got underway in late 1998, using then-current Storyspace 1.7.5, and was eventually upgraded through Storyspace 2.5.1. At that point, Mark Bernstein was concentrating on Tinderbox, so work on We Descend Vol. 2 was migrated to Tinderbox in 2006. In 2009, several experimental demos of We Descend Vol. 2 were constructed in Emberlight, a web app developed by Nathan Matias and Fred Cheung that published Tinderbox files directly on the web. But in 2011 Nathan accepted an offer to study at the Media Lab at MIT, so Emberlight's future became uncertain. 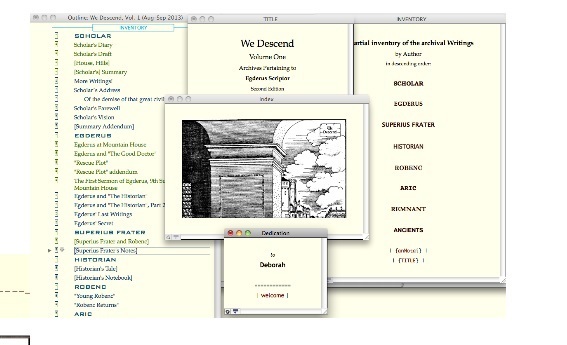 Tinderbox, a tool for making notes and visualizing information, improves on many of Storyspace's writing and organizing functions: its text engine is superior, and mapping has many more capabilities and much better aesthetics. Probably the best thing for me about using Tinderbox for developing We Descend is the ability to just write it, allowing organization to emerge organically, without my having to build containers and structures first, as I had to do with database-like programs such as Hypercard, and which is still the way with authoring platforms like Scrivener and most outliners. Tinderbox can export all or part of the contents of a file to HTML and OPML, permitting an author to publish to the web or mobile devices -- though considerable pre- and post-processing is necessary, involving a lot of trial-and-error backing and forthing to get a satisfactory result. Tinderbox does not provide for spawning a Reader app such as Storyspace offered, no doubt because "everything's moving to the Cloud" -- which doesn't sound like a very stable... um, platform to build on, to me at least, but maybe this is just another concept that'll take this first-term Truman baby years to get. In the meantime, I plan to soldier on in Tinderbox until We Descend is finished. Vol. 1 of We Descend is available on CD from Eastgate Systems. An HTML excerpt from Vol. 1 is featured in the Gallery at Word Circuits. A demo of Vol. 2 of We Descend can be read at its website and blog.